Residents within a roughly 17-block section of a Hawaii subdivision were given 24 hours to evacuate the area. Otherwise, they'll face possible arrest. As lava continues to spew from the Kilauea volcano, authorities in Hawaii have issued a new warning to residents: Obey mandatory evacuation orders or face possible arrest. 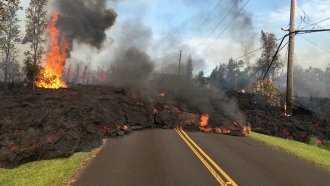 Big Island Mayor Harry Kim issued the evacuation order Thursday for a roughly 17-block section of a subdivision that's been hit hard by lava. Residents were given 24 hours to get out. A spokesman for the Federal Emergency Management Agency told Fox News that officials had no plans to search for residents in the restricted area after that 24-hour deadline and that anyone found there could be arrested. This spike in volcano activity has been going on for almost a month. As of Thursday, the U.S. Geological Survey said lava from Kilauea had covered 5.5 square miles of the island. As CNN reports, that's more than four times the size of Central Park in New York City. Prior to Kim's order Thursday, officials said roughly 2,500 people had evacuated the area.